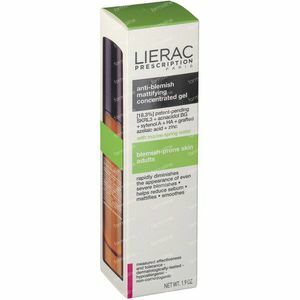 Lierac Prescription Mattifying Concentrated Gel Anti-Blemish 40 ml order online. A refreshing, light, non-greasy gel, ideal for adult oily skin that is prone to severe blemishes, to reduces even severe blemishes, smoothes and mattifies the skin. 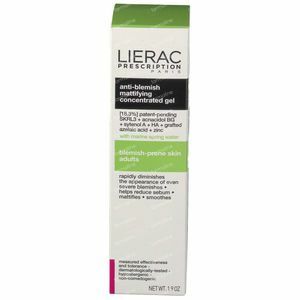 [LIERAC PATENT-PENDING SKRL3 TECHNOLOGY]: SKRL3 technology combines marine spring water which has reparative and regenerative properties with a prebiotic which encourages the growth of beneficial skin flora and boosts the skin's natural defenses, and water-harnessing biotechnological sugar. This innovation helps repair the skin barrier and protects the skin from environmental aggressions. The skin's balance is restored and its health is improved. [ACNACIDOL BG]: a derivative of castor oil, acnacidol BG is a new generation ingredient with seboregulating and purifying properties. 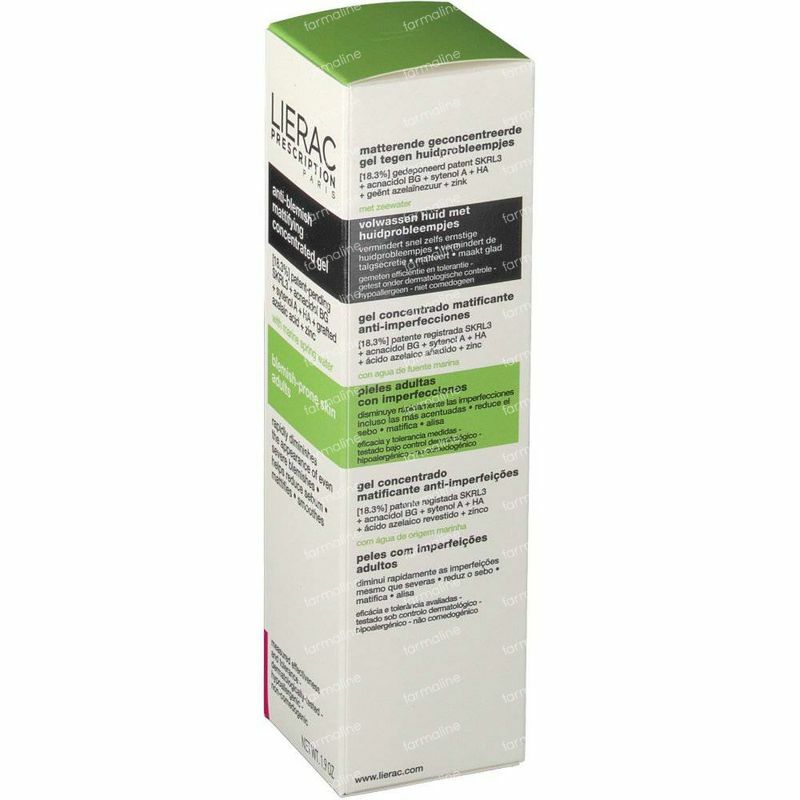 • Salicylic acid is keratolytic (chemical surface exfoliation) and helps other ingredients penetrate the skin. 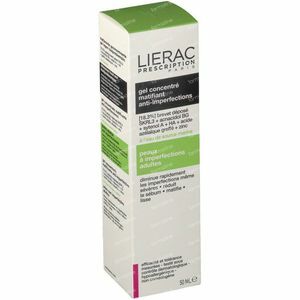 • Glycolic acid boosts deeper and very rapid penetration in the skin for remarkable cellular stimulation and renewal. • Lactic acid improves skin tolerance for formulas and is used for its keratolytic properties when used in concentrations higher than 2%. [GRAFTED AZELAIC ACID]: azelaic acid is used for its antiseptic action on Propionibacterium acnes, main cause for skin blemishes and for its regulating properties for cellular renewal. 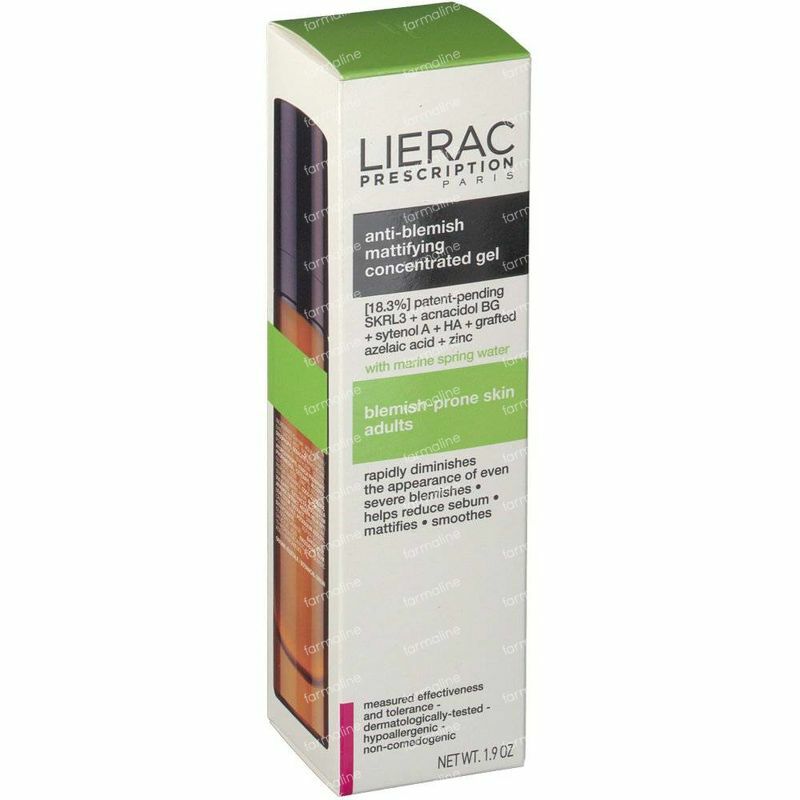 Selected azelaic acid is grafted on glycerin to provide more comfort and moisturization for the skin. [ZINC]: zinc, a trace element that exists naturally in the body, has seboregulating, soothing, anti-oxidant and purifying properties. 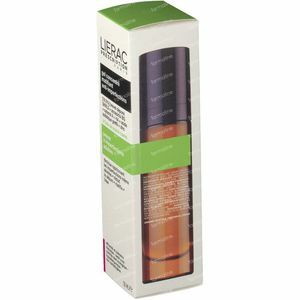 A very complete element that rebalances sebum secretion and purifies the skin. [ABSORBENT POWDERS]: selected absorbent powders are micronized powders. They are invisible and provide a matt, powdery finish to the skin. Apply morning and/or night after cleansing, on the face, avoid the eye contour. Aqua, Lactic Acid, Sodium Citrate, Diisopropyl Sebacate, Dimethicone, Polyamide-5, Butylene Glycol, Dimethicone Crosspolymer, Propanediol, Cetearyl Alcohol, Hydroxypropyl Starch Phosphate, Glycolic Acid, Zinc Gluconate, Parfum (Fragrance), Coco-Glucoside, Sea Water (Maris Aqua), Alchemilla Vulgaris Extract, Equisetum Arvense Extract, Hedera Helix (Ivy), Leaf/Stem Extract, Potassium Azeloyl Diglycinate, Alpha-Glucan Oligosaccharide, Bakuchiol, Salicylic Acid, Rhibozan Gum, 10-Hydroxydecanoic Acid, Sebacic Acid, 1,10-Decanediol. Origine Végétale. This gel slightly stings when you apply it but it's gone in no time. 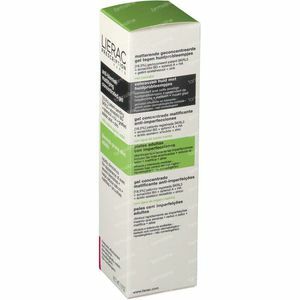 I use it as a strong night treatment, it's too strong during the day and you can't wear makeup on top.